On October 11, 2011, our son, Holden Joseph Flynn, was born with a complex congenital heart defect (CHD). By his 14th month of life, he needed 4 operations to repair his distressed and broken heart. Simply put, he went through more medically, than most of us will need in our lifetime. As parents we were there for every procedure. Every hospital stay. Every needle. Every drug. We watched him fight, and we watched his caregivers fight for him. On January 5, 2014, while awaiting a heart transplant, he lost his battle with CHD. Over the last two and half years we’ve been blessed to share Holden’s story as he carried on his day to day fight. His hospital featured him in a film, “The Tin Man”, that not only won national awards but opened avenues that allowed him to be an advocate for all CHD children. When learning of his defect we made a commitment to educating ourselves and teaching others about all aspects of congenital heart defects. We always said that once Holden was stable, we would do even more for the CHD community. With his passing, our goal remains the same. It is time for CHD to step out of the shadows and into the public consciousness. It is the number one birth defect in the world, affecting about 1 in 110 children. Not a day goes by where we don’t feel the masses need to know more about these noteworthy victories and the hard fought losses. And while survival rates have increased over the last few decades, that doesn’t change the fact that it still has a long way to go. CHD lags behind most childhood diseases in both awareness and funding. We created the Holden Flynn Fund on January 8, 2014 to help us build a foundation that will continue Holden’s fight in spirit. As we approach American Heart Month and CHD Awareness Week we write asking you to help us achieve this goal. 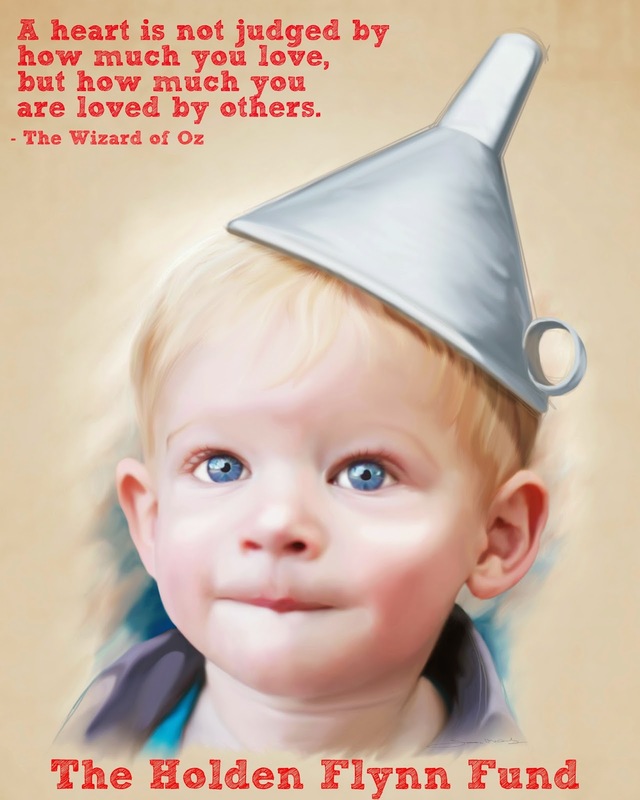 We’re committed to creating a foundation that would not only make Holden proud, but allow us to continue to leave The Tin Man's mark on this world. Over time we will do everything from assisting displaced heart families, to fundraising for research, and raising awareness at the highest levels. For two and a half years we dedicated our lives to caring for our son. For the remainder, we are dedicating our lives to helping the world to better understand such a crippling and unknown disease. CHD might have taken our son’s life, but that does not mean it has to take the life of another child. Please join us in making this foundation a reality and thank you for your support. OR ONLINE (Please understand that the donations added via Fundly will be later wired to the Schwab Charitable Account. Tax deduction letters will come through Fundly and NOT Schwab) For LARGER donations you are encouraged to directly send a check or money order.